Literature is the key that unlocks worlds of experience for us. In the Discovery Core, we read, discuss, and reflect upon stories which illuminate universal human experiences...and, in so doing, help us make sense of our own worlds. Not limited to the traditional novel, we will read essays, poetry, drama, and short stories & learn how to carefully (and confidently) analyze their messages. Watch for links below which will take you to readings, upcoming assignments, and homework. Use the "Contact Jolly" button if you need to send me a message about assignments or anything else of importance to you. I try to respond within two days. Click the image at left to find your score on the PSAT. You may need to create an account in order to do so, but the account is free. To whom or what is Atticus referring? What might he mean when he says, "...when you finally see them?" Choose one or more characters whom Scout came to understand better through the course of the story and explain how her view of them changed. B. Your first two Multi-Genre pieces are due Monday. If they are typed or online (such as a Kahoot), you can simply show me them on your Google Drive or Chromebook. If they are handmade/handwritten, you'll need to show me the actual pieces. This is a check-in, so you'll earn a few points for having them completed on time; however, there will be no make-up for this assignment if you don't have them. C. One point of clarification about a "small" genre: if you choose to make a Kahoot, it must have at least 15 questions/items on it. A. Mea culpa, as the old Greek said. The reading which I said was due Tuesday is now due Thursday. Answer all reading questions, of course. There will be a quiz. B. Complete the vocabulary antonyms and study for vocab. quiz #14. There is a practice exercise for the poem on Jupiter, so be sure to use it! C. Review the TKAM Multi-Genre Project. Note the due dates, which we will stick to even if I don't remind you about them here...but this time, I will: the Project Plan is due Thursday. Below is a good example of one to model yours after. A. I know, I know -- I didn't update this website by 7pm on Friday. However, there is an updated reading schedule which was posted below on April 2nd, and I'm holding you to that schedule. This means that there IS reading to do before Tuesday, so get it done. There will be a quiz but I won't check the reading questions until Thursday. A. Read chapters 25-26 in To Kill A Mockingbird. Answer all reading questions. B. Your revised Ethnobotany Research papers are due Friday. If I'm reading your paper, bring me a printed copy on Friday morning (I'll be in my room after 8:30). If Fenton is reading your paper, she wants you to share your Google doc with her. If Kaufman is reading your paper, you'll have to check with him. A. Finish the draft of your Ethnobotany Research paper. We will share these in class; you will give feedback to one other student about their paper. See the link under "Ethnobotany Project" at the top of this page for MLA format. B. Check the updated reading schedule below (see "Homework due Thursday, April 4"); read the assigned chapters and answer all reading questions. A. No assignments are due. However, the completed draft of your ethnobotany research paper is due on Wednesday, so get started now. There will be other homework due Wednesday and I do not want you to get swamped. A. Study for vocab. quiz #13. B. Check Jupiter ("My Files") after 7pm tonight (Tuesday, 4/2). You will find two others' stereotypes articles to evaluate using the rubric sheets I handed out in class. Bring the filled-in sheets with you on Thursday. C. Lit Circles #4 are on Thursday for chapters 20-22 in To Kill A Mockingbird. 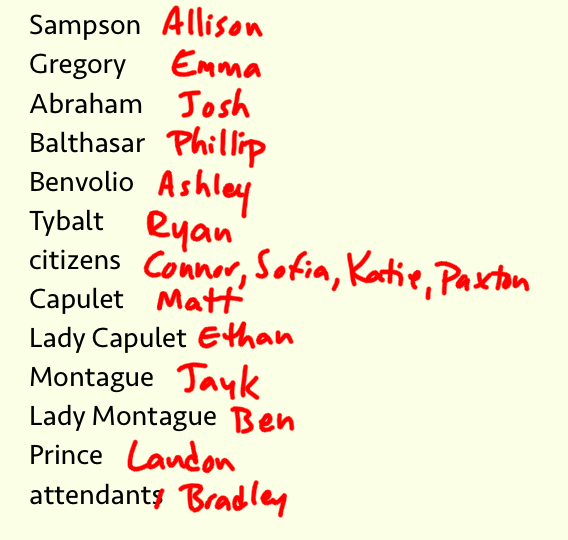 Click the links below to see your correct roles for Thursday. D. If you shared your Ethnobotany Outline with me, I'm done commenting on them. You can see my comments on your Google doc. Please, pay attention to the notes I've made so you can make your papers as strong as possible. Many of you need more information and I've identified specifically which sections those are. Make those additions and start turning this into a paper soon -- the first draft is due next Wednesday. (I won't assign any homework over the weekend so you can get started.) Let me know if you've got any questions. ​A. Read chapters 17-19 in To Kill A Mockingbird. Answer all reading questions. B. If your Stereotypes Article -- Revised is more than 400 words, you've got to cut it down to no more than 400. This involves cutting out some words/sentences and rephrasing/summarizing others. This video may be helpful. Login to Jupiter; click on "My Files"
Click the "New/Upload" button at top and select "New Juno Doc"
Click in the "Title" box and type "Stereotypes Article -- revised"; paste your article in the space below, then click "Turn In"
In the "Turn in for which assignment?" box, click on "Stereotyping Article: final draft"
A. Read chapters 15-16 in To Kill A Mockingbird. You do not have to answer the reading questions. We'll have Lit Circles on Friday, so refer to the class lists for your role. NOTE: as I showed in class, you'll have the role that is two spaces below where your name shows. Use a good hook -- I recommend either a question & answer or an anecdote. Use many paragraphs to break up the information and give your reader a chance to digest each big idea. Click on the assignment in Jupiter (the first draft) to see the rubric which I'll use to grade them, then make yours as strong as possible. We will copy and paste these into a new Juno Doc in class on Friday. 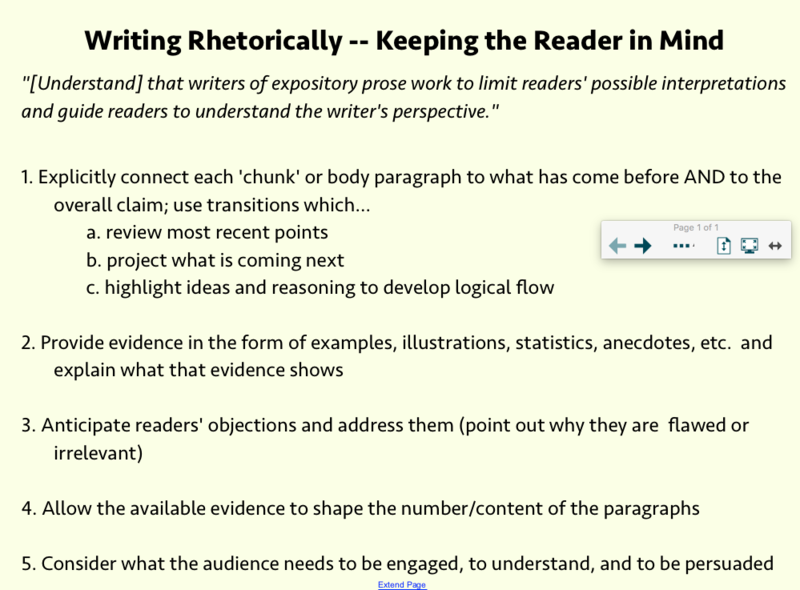 A. Click the image at left to see a reminder of the Five Points about Writing Rhetorically. Refer to this as you write your article about whether stereotypes at WHS are a big deal or not. Your first draft of 1-3 paragraphs is due on Wednesday; we will peer-evaluate them in class using Jupiter. ​B. Read ch. 12-14 in To Kill A Mockingbird. Answer all reading questions and be ready for a quiz on Wednesday. We will have our next Lit Circles on Friday. C. Create an outline for your Ethnobotany Research paper. See the instructions in this video (but remember that there is no "outline" format under "Tools", like I showed in class). You may use footnotes like I showed in class for this outline; be sure to write complete sentences like Mrs. Fenton showed you (you can see the link on her webpage). No assignments are due! However, there will be three chapters to read for Wednesday, March 27, so I suggest you read 1-2 chapters over the break. Answer all the reading questions for those chapters. Also, you will have the outline for your Ethnobotany project due that Wednesday. I'll explain how to outline in Google Docs in class on Monday, but it really makes it an even better idea to get ahead on the reading in To Kill A Mockingbird. The image above is the slide about phrasing your argument about stereotyping. We will return to this issue in class on Monday. Enjoy your break! A. 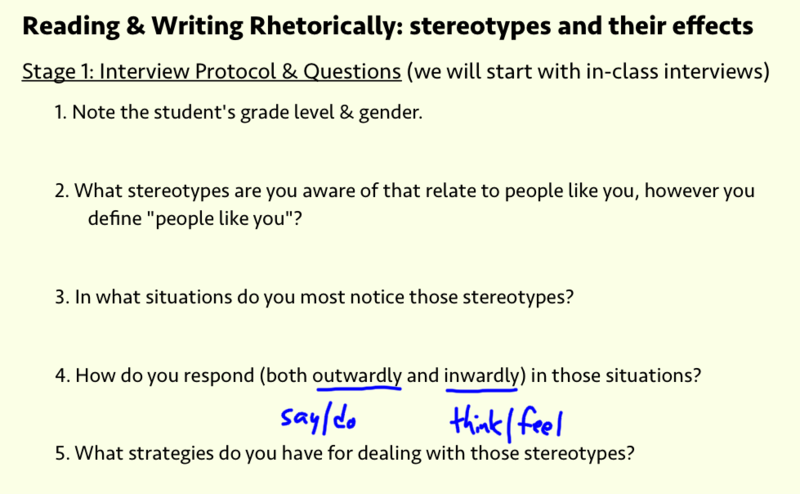 Finish posting the responses to your stereotyping interviews on the correct Padlet walls below. B. Read ch. 10-11 in To Kill A Mockingbird. Answer only the following reading questions: ch. 10, q. 1 and ch. 11, q's 1 & 6. 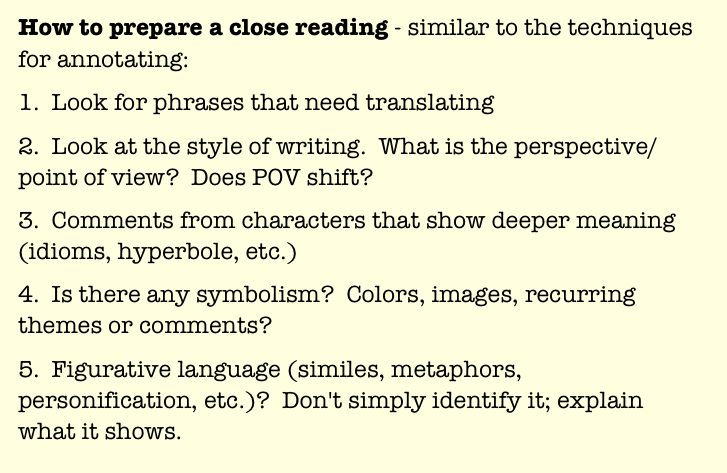 As well, prepare for our second Lit Circles -- but your role will be the one which was below yours from last time (e.g, if you were the Summarizer, you'll be the Passage Master; if you were the Illustrator, you'll be the Discussion Director; and so on). C. Study for vocab. quiz #12. Practice the easy poem on Jupiter -- the 'assignment' titled "Poetry Practice" is for this, and it won't count against you in the gradebook. A. Stereotype interviews: Interview two WHS students who haven't been interviewed and record their responses in your notes. Click the thumbnail at left to see the interview protocol & questions. B. I was unable to take clear photos of the stereotype summaries we put on Post-It notes, so instead I'll leave them on the whiteboards for us to refer to on Tuesday. A. Keep up on the reading for To Kill A Mockingbird (ch. 5-6). However, instead of answering the questions, I want you to write one paragraph in your English Journal stating whether you agree or disagree with this claim: "The kids' obsession with the Radley family overshadows nearly everything else in their lives." As Josh would request of me, use evidence to support your answer! B. Finish your initial Ethnobotany research. 2-1/2 pages of notes are due Friday. These can be handwritten or on a Google doc which you can access in class on a Chromebook. A. Download the "Jim Crow Websearch" page. Read the instructions and write responses in your notes. These will be checked on Wednesday. If the links on that page don't work, use the buttons below. B. Read ch. 3 & 4 in To Kill A Mockingbird and answer the reading questions. C. Keep researching your plant for the Ethnobotany Project. Click "Plants for a Future" at right for a good source of information. B. Read chapters 1-2 in To Kill A Mockingbird; download, print, and complete the reading questions. All answers to questions must be in complete sentences. See the buttons below for info. C. Finish your rhetorical precis on the Twilight Zone episode "The Monsters Are Due On Maple Street." Copy this into a new Juno doc and submit it for the assignment titled "Twilight Zone rhetorical precis." A. No new assignments are due; however, if you didn't get your revised rhetorical precis turned in on Jupite​r, be sure to do so before Thursday for credit. B. Bring your copy of To Kill A Mockingbird to class on Thursday and every core day thereafter. C. There is a new link above for the Ethnobotany Project. That is where are details about the project will be posted. Check it regularly! A. If you didn't finish in class, answer the remaining questions for the Twilight Zone episode "The Monsters Are Due On Maple Street." B. Revise your Rhetorical Precis on self-fulfilling stereotypes. Open the version you created on Google, then open a new tab and sign into Jupiter. You can see the suggestions that others made by clicking on "My Files" and then clicking on the versions under "Not Turned In." Click on each one and decide which changes you should make. Make these changes on the version on Google. When you are done, copy that version. Go back to your Jupiter tab and click on the "Upload/New" button, then select "New Juno Doc." Paste your revised version there and give it the title "Rhetorical Precis -- revised," then click "Turn In." You'll see the new assignment there. A. 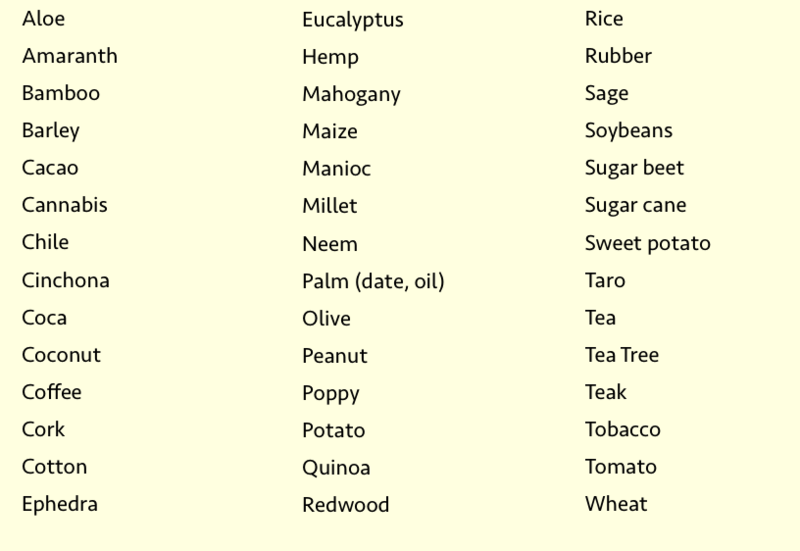 Make sure that you & your partner have a list of 10 plants that you'd be willing to research. We will conduct a topic selection lottery next Tuesday during block 6B. The list of topics is the image at left. B. If you didn't finish the noredink exercise on quotes, do so before Friday. C. Rhetorical Precis for the "Self-Fulfilling Stereotype"' essay: finish it, then type it into a Google doc. You will then need to submit it to Jupiter for the "Rhetorical Precis -- self-fulfilling stereotype" assignment. Click this link to see a short video on how to do so. NOTE: this must be done by 9:00am Friday no matter which class you are in. ​A. In class, we read, 'chunked', and annotated Shankar Vedantam's "How a Self-Fulfilling Stereotype can Drag Down Performance." Respond to the questions on the back of the sheet titled "Reading Rhetorically -- Activity 7: Considering the Structure of the Text." Each answer should be 2-4 complete sentences. Remember that you should always explain why you came to the conclusion you did even if the question doesn't explicitly ask for that. A. If you didn't do this in class, click the image at left to submit your short story Weebly page URL. B. Study for vocab. quiz #11. There is a poetry exercise on Jupiter (it shows in the assignments as "I Am Not Yours" practice). It's not required but it might help you to ace the poem. A. There is a Jupiter forum open for you to respond to by 9:00am on Wednesday. B. Finish the noredink.com exercise on "Subject/Verb Agreement, pt. 4: problem subjects." A. No new assignments are due. However, if you didn't finish the noredink.com exercise on "Subject/Verb Agreement, pt. 3: collective nouns", you'll have to finish that by 9:35am on Friday. A. Login to noredink and complete the exercise which is open ("Subject/Verb Agreement, pt. 2: or and nor"). B. 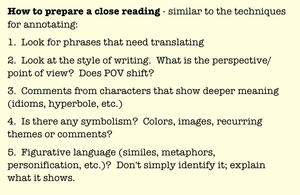 Plan for the in-class writing assignment on Wednesday related to the collection of short stories you read recently. Click the image at left for more details. Note that you may not use any materials other than your book. A. Complete the vocab. antonyms and study for the quiz. B. If you didn't finish the noredink exercise on subject/verb agreement, log back in and get it done. D. Those who are joining us for the STEM Project Air Drop on Thursday: we will meet under the arch at 7:50. 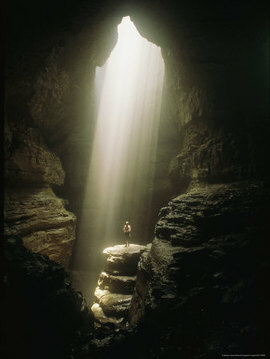 Look for me there among the multitudes. Bring a bag lunch with you. I'm looking forward to this! A. Revise your short story. Put the proper heading at the top left corner, give it a good title (if you haven't done so already), and bring a printed final copy to class. What changes did you make to your story and why? What was one change which was suggested that you decided not to do? Why not? C. Those of you who showed interest in joining the STEM core for Project Air Drop next Thursday: please bring your filled-in field trip forms to me on Tuesday. A. Did you see the note above for Verizon Wireless customers? It's important. Please take care of it. B. Keep reading your book of short stories. You should be finished by Friday, Jan. 25. C. It's time for your short stories! A 3-7 page story (typed & printed, 1.5 spaced, with only your student ID number at the top) is due. We'll have time for an in-class read-around where you'll get feedback from your peers. There will also be time to start revisions in class, so bring a laptop/chromebook of your own if you have one (I don't quite have enough for everybody in my room). I'm looking forward to your stories! A. Study for vocab. quiz #9, O captain my captain! Point of View: stories work best if you use the first person narration. Third person limited can be OK, too, but do not use third person omniscient - it kills the mysteries of why characters do what they do. Plot: got a clear beginning, middle, and end? Good! If you need some ideas of what to write about, click the image at left. A few more points are in the thumbnails below. A. Keep reading your collection of short stories. Either read two stories or the equivalent of 40 pages. We will have discussion tables about the stories we're reading on Friday. B. Write a one-paragraph biography of the main character you'd like to write a short story about. 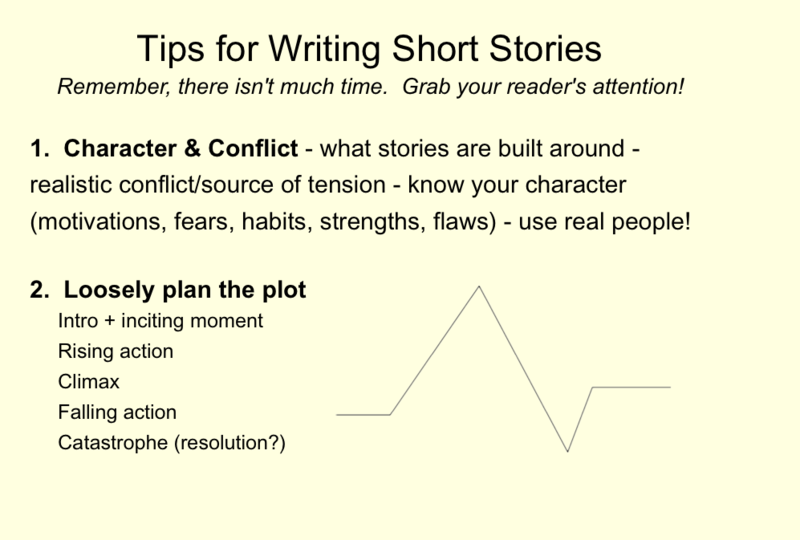 Also, write a 2-3 sentence plot outline for your story. Don't worry about this too much -- it's just something you can use to get started and to stay focused. C. Choose the best first paragraph from any story you've read so far in your independent reading book. Be ready to share it with others in class on Wednesday. Reading these "Best Beginnings" will give us some good examples/ideas for getting started in writing our own stories. A. 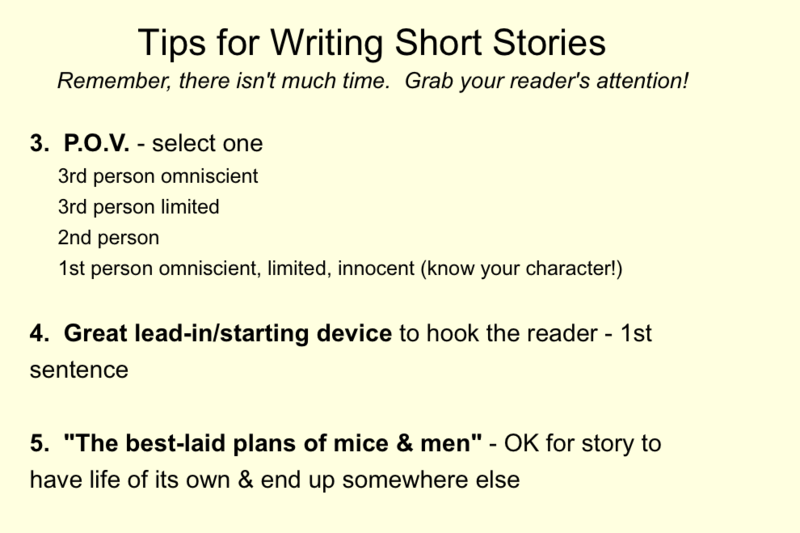 Keep reading your collection of short stories -- as before, aim for two stories (or roughly 40 pages) per core day. B. There is a Jupiter forum open for you to respond to. Read the prompt carefully to ensure that you use the words correctly, but have fun with it. We'll all be able to read each other's responses in class on Monday. A. Read two stories (or the equivalent of roughly 40 pages) in your independent reading book. B. If you didn't finish in class, complete the exercises on commas for formatting and introductory clauses at noredink.com. A. When we return from break, we'll study short stories and craft a short story of your own. I'd like you to choose a collection of short stories to read, study, and share during the next grading period. See this page for an explanation of the assignment. You need to have selected and acquired a title (and, if necessary, bring a note of parent permission) when we return from winter break. You will have to acquire a copy of the book on your own. I suggest that you purchase your own, either online or through a local bookseller such as Pages (on the Town Green). You can, however, try to locate a copy through the school or county libraries...but this often takes considerable time, so plan ahead. If you've found a title you want to read, go to the library as soon as possible to see if you can get it there. Bring your book with you on Jan. 8. NOTE FOR FINALS: Final essays are just that -- a final demonstration of your writing at this point. Most other assignments for my class are designed to help you improve by giving you feedback, but this is not the case here. You will have this experience many times in the future when writing final essays for other classes, or taking the SAT, ACT, or AP tests. Consider these grades simply as one indication of where you are right now in your writing, and let them go. Unlike other assignments, they will not be open for discussion nor explanation. A. Study for vocab. quiz #8. B. Finish Sitt Marie Rose. In your binder, take notes on how each character (in order: the deaf-mute children, Marie-Rose, Mounir, Tony, Fouad, Buona Lias, and the unnamed female narrator) reacts to Marie-Rose's predicament/execution. Romeo & Juliet: all notes on plot, characters, symbolism, etc. I've linked the Quizlet on literary terms to the image below. I encourage you to make a set for the vocab. words on your own OR split up the lists with some friends so you can collaborate on a new set. ​A. Read pp. 53-76 in Sitt Marie Rose. Finish filling in the "Speaker & Chart." B. Log into noredink.com . There is an exercise due titled "Pronouns: case and antecedent agreement" to complete by 9:00am on Wednesday. C. You may have seen the sign below on my whiteboard (click on it to see a larger version). I totally dropped the ball in announcing this and getting people involved, and now time is running out. 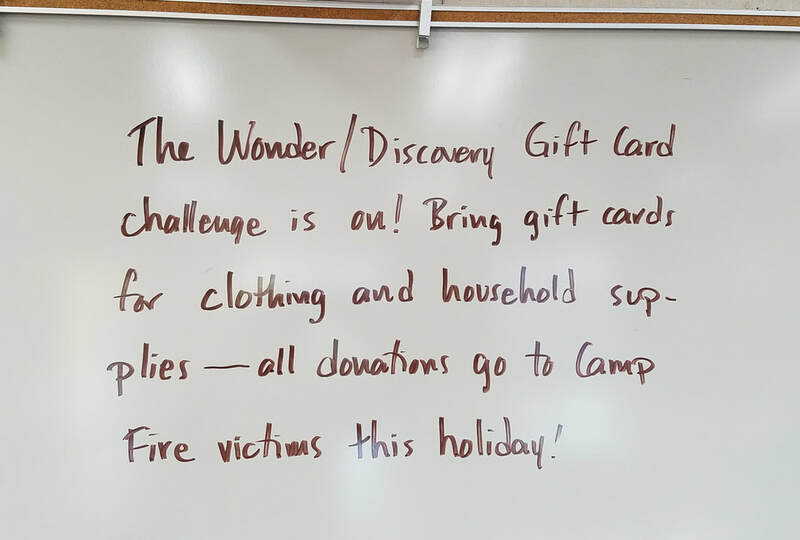 If you feel like bringing in a gift card for fire victims, I'll collect them until next Thursday (Dec. 20). Mrs. Green, the History teacher in the Wonder Core, and I will send them to a relief organization in Butte County. B. Read pp. 29-52 in Sitt Marie Rose. Fill in the "Speaker & Summary" chart -- ALL of the front side and the first two boxes on the backside. C. If you ever worry about your online privacy, I found an infographic that explains a few ways to protect yours. Click the image below to see the full version. A. Doh! I didn't update this website by 7pm on Tuesday, so you have no assignments other than what's listed below. Doh!! B. Join your Discovery class on noredink.com, an online source we will use to practice grammar. See me for the link. A. Watch "Lebanon Civil War 1976" up to the 19:15 mark. Click the image at left to see the film. Answer the remaining questions on the sheet handed out in class -- you'll have to look up the meanings of "sectarianism" and "Phalangists." Answer all questions in complete sentences. Note the title of this section; it creates a parallel with the civilians in the war. What is destined to happen to the people? Who in the group is the deadliest person, based upon their descriptions? Where do the construction laborers in Beirut come from? How does the war start? Cite three descriptions that clearly show you the chaos which Beirut falls into. Note the bullet points on pp. 22-23. What is the effect of these details on you, the reader? A. Study for vocab. quiz #7. There is a practice poem on Jupiter; click on "Poetry Practice: next to god of course america i" and put the lines in the correct order. You can repeat this as many times as you'd like. B. Finish your Blackout Poem for a character from Their Eyes Were Watching God. Remember, your poem needs to illustrate a character's attitudes, values, or style. The rest of the page either needs to be blacked out completely or incorporate some artistic element so that there is no unintended blank white space. C. Remove all of your annotations from your book (if they are on post-it notes) and bring your book with you. We'll be dropping them off at the library and picking up a short novella about the Palestinian civil war which will take us to the end of the semester. A. Complete vocab. synonyms #7. Type your passage into a document (double-spaced) and print it out. Annotate it, as we did with the sample passage I projected on the board in class. 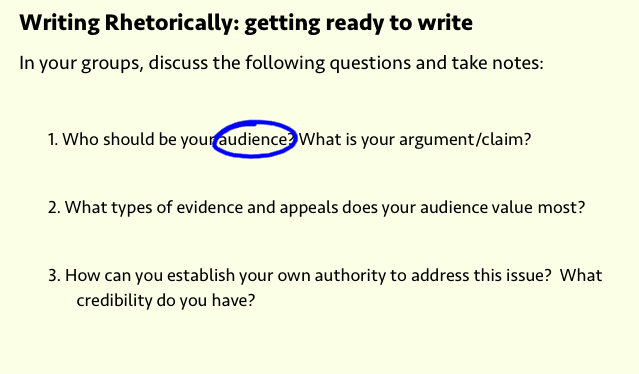 Look at your ideas/annotations and pick three which are all related somehow and which you feel most confident about. These are the pieces of evidence you'll use in your written analysis. Read this sample analysis to see how I turned my annotations into a clear, well-supported paragraph. Type an analysis of your own. Print it out, staple it on top of your annotated passage, and bring them to class on Wednesday. ​C. On Friday we're having a down-on-de-muck Jook Joint, just like all the folks down around Belle Glade! Bring something to share (enough for 4-6 people but no candy nor soda - see class lists below) and learn a card game to teach us. We'll have music and a whole mess uh fun during 6B. The rest of the day will be divided into 1 hour blocks. A. Read chapters 18-19 in ​Their Eyes Were Watching God. Annotations as usual -- 1 for every two pages on average. B. Finish English Journal #7. I will check this when we return from the Thanksgiving break. 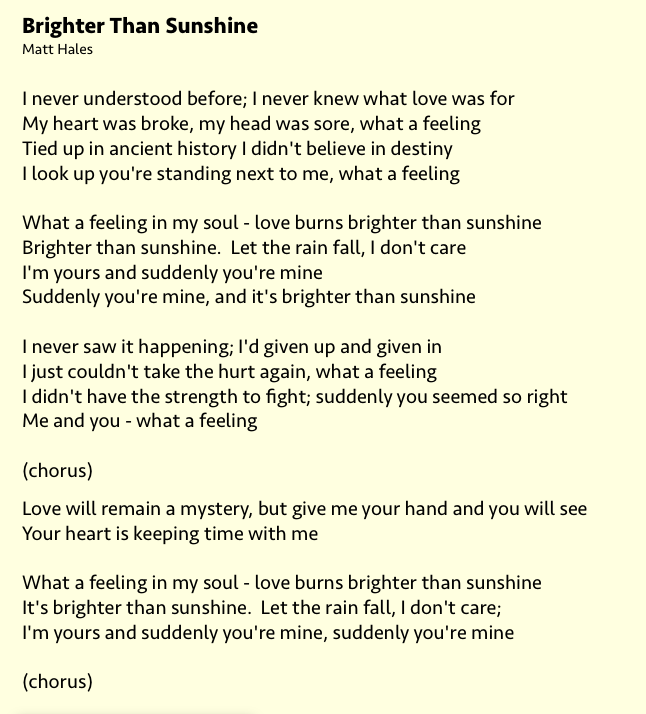 The topic and lyrics to the song are below -- click on the thumbnails. ​A. Read chapters 15-16-17 in Their Eyes Were Watching God. Annotations as usual -- 1 for every two pages on average. B. I'm in the process of developing a new unit for the CSU curriculum that helps prepare students for college (as I mentioned in class, "The Pursuit of Unhappiness" and the related activities we've done with it are part of that curriculum). I've found an essay which I think is interesting and would like to know your thoughts about it. It's about getting rewards for doing things and whether rewards even work at all. Please read the essay ("Science Confirms It: People Are Not Pets"). There is a Jupiter forum about it; respond before 8:00am on Tuesday. A. Study for vocab. quiz #6. Listen to Maya Angelou's recital of the poem (just the first two stanzas) to help with memorization; click her image at left. ​B. Read chapters 9-10-11 in Their Eyes Were Watching God. Complete an average of one annotation for every two pages. A. "The Pursuit of Unhappiness:" finish making notes in the left margin about each section you identified. Answer each of the seven questions on the "Considering the Structure of the Text" handout (3-4 complete sentences each). We'll discuss your ideas in class. A. Read chapters 6-7-8 in Their Eyes Were Watching God. Complete annotations following the instructions in the Annotations Schedule (below). What are the main obstacles to success that girls around the world are facing? What solutions does Gbowee mention that will help girls overcome these obstacles? A college professor I had years ago made a distinction between wishes and wants. “A wish,” he said, “is something you simply dream about, but when you truly want something, you are willing to do what is necessary to get it.” Does Gbowee describe wishes or wants? Support your answer with specific examples. B. Read chapters 4-5 in Their Eyes Were Watching God. Complete annotations following the instructions in the Annotations Schedule (below). A. Study for vocab. quiz #5. Remember Robert Hayden's poem! B. Read chapters 2-3 in Their Eyes Were Watching God. Annotate according to the schedule linked below. C. If you didn't finish in class, finish your symbolic artwork for Romeo & Juliet. A. 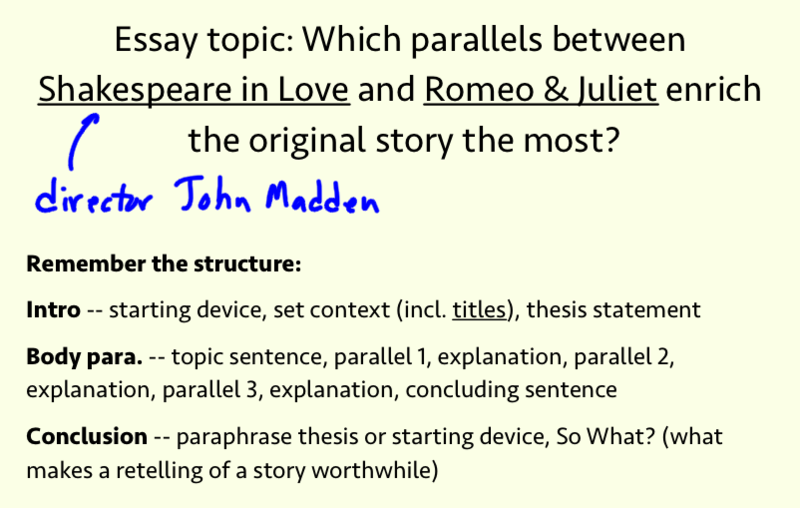 Finish your short essay on parallels between Shakespeare in Love and Romeo & Juliet. Essays must be handwritten. Click on the thumbnails below on the right to review the purpose, topic, and format. B. Read chapter one in Their Eyes Were Watching God. Remember, you'll have to read the dialogue out loud to understand what's being said. As you read, make annotations. You can review the annotation instructions below (on left). The annotations schedule is also below (on right); be sure to follow it, since I'll check annotations for chapter one only on Tuesday. C. The deadline for core t-shirts has been extended until Tuesday! Bring $13 (cash only) to me anytime. B. Got $13 for a core t-shirt? Bring it to me on Friday. Cash only, please! Well, I didn't update the website by 7pm, so you are off the hook. No assignments are due! A. Study for vocab. quiz #4. With your infographic open (on the page you can edit), click "Share" at the top right of the screen. On the next screen, click "Publish for Web"; when the window pops up, use the title it gives you but replace "A class project created on Visme" with your name and class name ​(ex: Phil Anderson, Current). A. 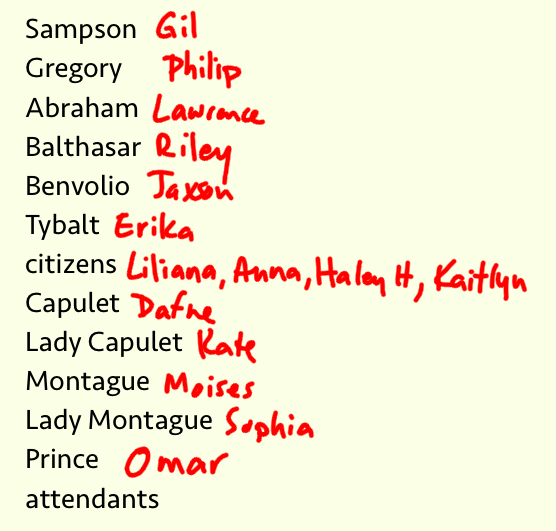 The following students have not turned in their film permission slips for Shakespeare in Love. Tuesday is the last day to turn them in! How does Romeo convince the apothecary to sell him poison? What is Friar Lawrence's new plan once he learns that Romeo never got the letter? Why does Paris go to the graveyard at night? How does Romeo show some compassion to Paris? What is the positive spin at the end of the play? C. Create a first draft of your infographic on child marriages. As you look through the templates on Visme, choose one with three main sections to correspond with the three main topics of your research paper. Good images include maps, photos, charts/graphs, and graphics of different sizes. Make sure that your colors and graphics are all of the same type (which should be easy, since Visme's templates are already set up like this). D. Finish your research paper on child marriages and bring a printed copy to class. Your conclusion should recap your three main points and finish with a hopeful vision for a future free of child marriages. Read the formatting tips by clicking on the image below ("Margins" through "Placement of the Works Cited" only). how does Romeo convince the apothecary to sell him the illegal poison? B. 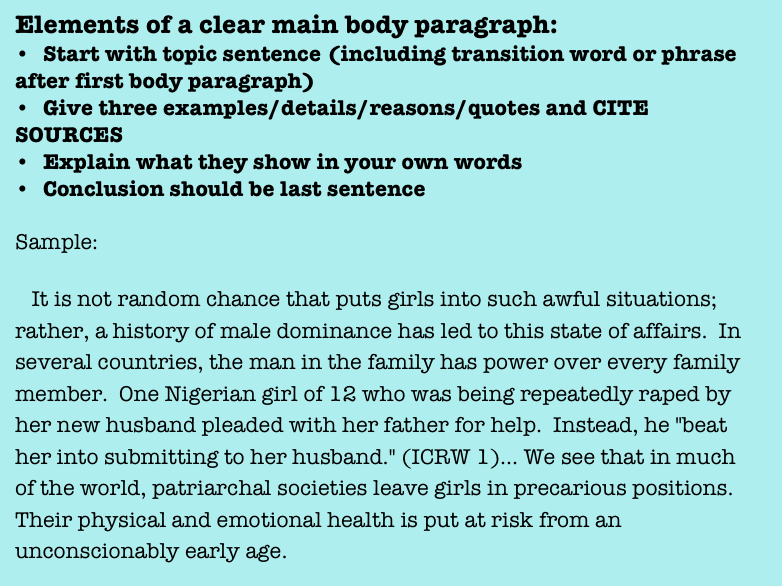 Write your three main body paragraphs on child marriage. See the instructions and a good sample paragraph by clicking on the image below on the left, just be aware that it is an incomplete paragraph (there should be several sentences where the ellipses [...] are). You should type these directly into the document you used for your introduction. Just remember this important detail: whenever you cite a specific bit of data or information from any source (including the ICRW Factsheets), you must cite that source in your paragraph AND in your Works Cited page. To see an example, look again at the images below. A. Read Act IV, scenes 4-5 in Romeo & Juliet. Expect a quiz on all of Act IV on Wednesday. Focus on the reactions of the characters to Juliet's "death" (Paris & the Capulets vs. Friar Lawrence vs. the servants/musicians [who really only care about silver & gold]). If you want to watch while you read (or before, or after), here's part 2 of the BBC version; start at 31:00 and ends at 42:00. B. If you didn't deliver your monologue today, be sure you are ready for Wednesday! C. Bring your Film Permission slips for Shakespeare in Love. They must be signed and indicate if you may or may not watch it. For parents who want to know more about this film and why it's rated R, I suggest looking through the reviews on Common Sense Media. 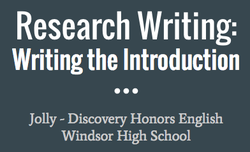 D. Click the image below to view the video about writing a good research paper introduction. The intro for your research paper on Child Marriages is due on Wednesday; either bring a printed copy or be ready to sign in & show me on a Google Doc. A. Finish your Personal History infographic. Be ready to access it online to show others in class (if time). B. Memorize your Shakespeare speech! Click the image above to see the rubric we created -- it will be used for grading. 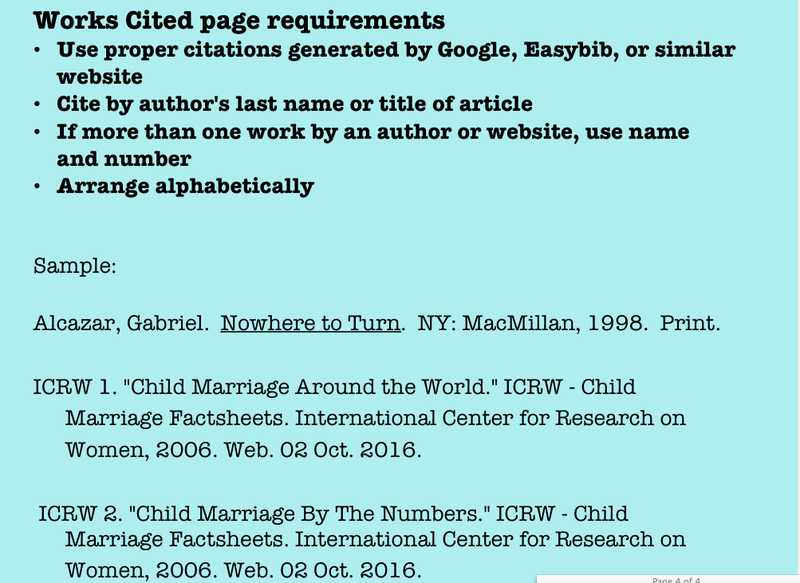 C. Using the links below ("Child Marriage Factsheets"), add to your notes about child marriage, but this time add 5 powerful solutions to it. NOTE: I didn't get to check the child marriage research homework in class on Tuesday, so I'll check it on Thursday. A. Study for vocab. quiz #3. Practice the poem! B. Spend 10 minutes per day memorizing your monologue from Romeo & Juliet​. Doing this daily will help you remember the lines. Here are the BBC Tips for Learning Monologues (pages 1-3 only). Why does Juliet cry, and why does Paris think she cries? What is Paris' tone as he addresses Juliet? How does he seem to think of her? What is Friar Laurence's plan for Romeo & Juliet? Pay close attention to the steps he describes. How does Capulet treat Juliet? As Juliet goes to bed, what bad outcomes does she think might happen? D. Begin creating your first infographic on part of your Personal History. Make sure it's created and saved in your Visme account. We will have time to work on these in class on Thursday. ​Here are the BBC Tips for Learning Monologues (pages 1-3 only). Click the image at left to go to Visme, the online tool we'll be using to create our infographics. Click the image at right to view the Visme instructional video on YouTube. others? As long as they are at least 25 lines, you can use them. You can also look ahead to find a powerful speech from later on in the play -- just make sure that you select one which you like! On Tuesday, bring a handwritten or printed copy of the speech to class. Annotate it for key words, unfamiliar words spelled out phonetically, and notes for points of emphasis or emotion. This should include both highlighting AND notes in either margin. Recitals are not due Tuesday -- we will have some time in class to learn about good memorization techniques and to practice our monologues. B. Using the "Child Marriage Factsheets" linked below, find five bits of hard data (numbers, dates, percentages, ages, etc.) that show the extent of the problem. Create a Google doc to record this information; title it "Child Marriage Research". Type a complete sentence containing each bit of data into the doc, then copy & paste the URL directly below that sentence. Use the most powerful or illustrative bits of data you find. Next, look for five explanations of why it happens. As before, cite these explanations (paste the URL) and write each one into a complete sentence of your own. Be ready to show this to me in class. Here is the link to the ICRW's Child Marriage Facts & Figures page. Here is the link to the Child Marriage Factsheets. A. Read Act III, scenes 1-3 in Romeo & Juliet. As always, if you need help visualizing the action/emotions, watch the film (start at 1:18:35) before, during, or after you read. Pay attention to the cause(s) of the deaths in these scenes ('airy words', perhaps?). Note also Juliet's initial confusion when Nurse brings the news as well as the young newlyweds' reaction to the "b-word". B. Read the first five pages of the National Geographic article on Child Brides. You should take Cornell notes which summarize the main point of each paragraph; then, create 3-5 questions you have about the article or the topic in general. We will discuss these responses in class on Friday. If you want to review the Pulitzer Center's film Too Young to Wed, click the image at left. A. Read Act II, scenes 3-6. You may watch the action while you read; click the link below for seeing the scenes online. Pay close attention to who knows about the marriage, how it will take place, and what each character hopes will come of it. A. Study for vocab. quiz #2. Remember, memorizing the poem and knowing the roots are part of the quiz this time & every time. B. Bring your analysis of 5 lines/sentences to class (if handwritten) or be able to access them online using a device in class. We'll look at some of the best ones together to see what makes the writing strong. A. Read Act I, scenes 4 & 5 and Act II, scenes 1 & 2 at the No Fear Shakespeare website. You can also watch the scenes online (30:25 - 56:00) to see how it's being played; it will probably be easier to watch it first, then read. In your notes, write down 5 sentences from these scenes which are the most meaningful and write 3-5 sentences for each selection explaining why each is meaningful. Read the instructions and an example here. There will be a quiz on Act I, scenes 3-4-5 and Act II, scenes 1-2. A. If you didn't get to write positive comments for two well-written paragraphs on the Jupiter forum, please do so by Friday. You'll have an easier time commenting from your home computer than we did with the iPads in class. B. Speaking of those Jupiter forums, if you look at yours and can see ways to improve it, do so. Post your revised paragraph under the "Comment" link at the bottom of your original response. Don't worry if it looks odd -- that's the one I'll look at when I grade them. C. If you have a speaking part in our performance of Scene 1, practice your lines. (The cast lists are below.) Be ready to speak with emotion (whatever the proper emotion is) on Friday. Directors: be ready to direct the cast! A. Reading & notes: read scenes 2 & 3 from Act I in Romeo & Juliet. Your notes should continue the notes you've already begun about what is motivating each of the characters. There will be a quiz on the main characters & quotes they recited on Wednesday. 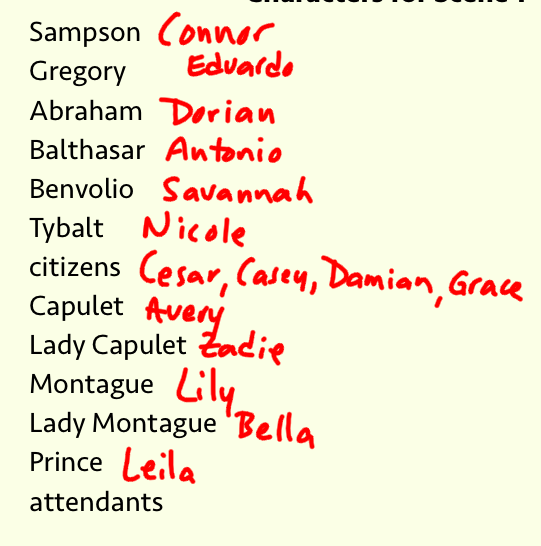 NOTE: main characters list now includes Paris, Capulet, Lady Capulet, Nurse, and Juliet. B. There is a Jupiter forum open about a song for scene 1. When you log into Jupiter, click the "Messages" link at the top left, click on the message, read the instructions, and complete the assignment. A. We'll be reading Romeo & Juliet at the No Fear Shakespeare website. I like this site because it's got modern translations on the right side of each page. However, you'll be responsible for knowing what is written in the original text (on the left side). For Friday, read Act 1, scene 1. Take notes on the following characters, identifying as best you can who they have affiliation or friendship with & what their primary emotion or attitude seems to be. Finally, jot down one comment each character makes that captures their attitude well. A. Study for vocab. quiz #1. You'll need to know the meanings (and how to spell) the 15 words as well as the Bedeviling Homophones. Memorize the Famous Quotation, too. B. Romeo & Juliet prologue: our Choral Competition is on Wednesday. You'll have 10 minutes to practice with your groups before we start. 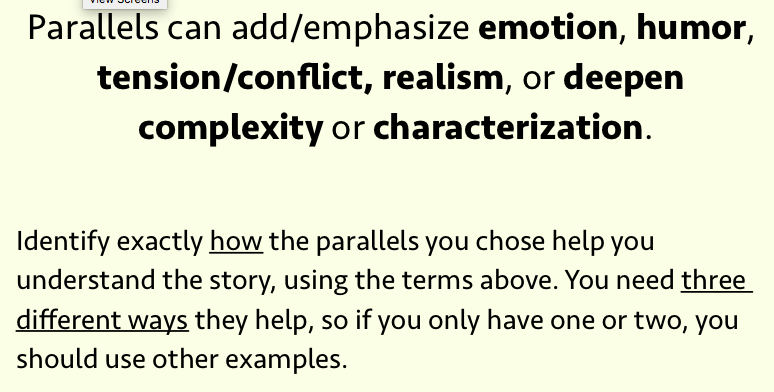 You don't need to have the whole prologue memorized, but you do need to highlight or otherwise mark your copy to indicate which words will be emphasized, what emotion you'll convey, and any other details your group discussed in class on Monday. C. We started reading in class about two families whose "ancient grudge" becomes a "new mutiny". Why do people hold grudges, and what are the effects? Read this article and take notes in your binder about the topic. Then, read this piece about how angry our society is now...and why it might not be a bad thing. Again, take notes. There will be a short quiz about the articles and a discussion in class about the impact of anger & grudges in our lives, putting us in a great position to understand what the public situation was like in old Verona. A. Log into JupiterEd and have a parent log in as well. I can see who has logged in by date & time. This must be done by 8:00am on Monday to earn credit. If you don't get this done by Monday, you'll still have to do it but you won't earn credit. ​B. If you want to have access to the cold, filtered water in the classroom, bring water money - click the "Water!" link above for details. 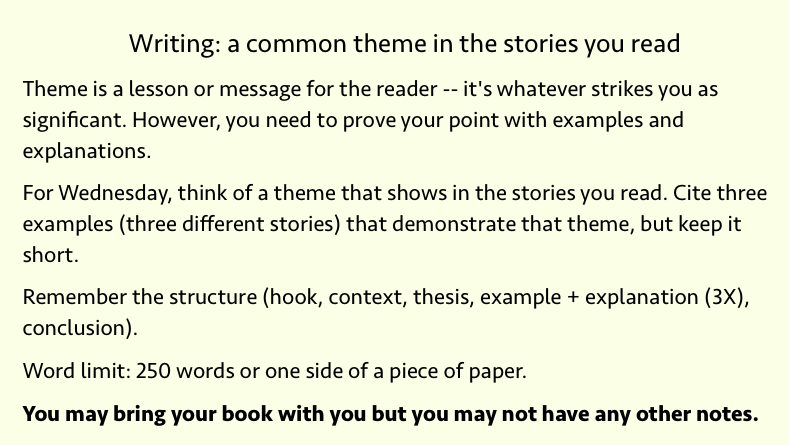 Introduce yourself, give an overview of the book, and include a clear thesis statement which tells whether it is or is not a successful book. If your claim is that it is successful, explain one weakness but 2-3 strengths. If your claim is that it is unsuccessful, explain one strength but 2-3 weaknesses. 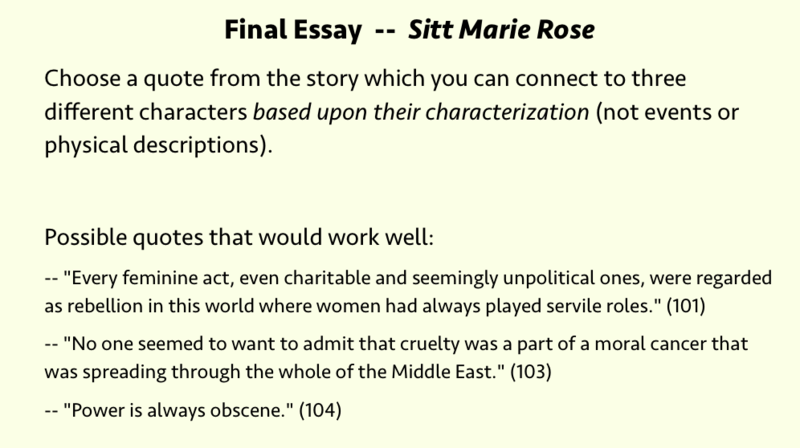 Use a neat, short conclusion which summarizes your main points. Finish by saying, "Thanks for listening." B. Bring your typed Random Autobiography. Click these links to see the assignment or to review my Random Autobio. C. Want filtered water for the year? Bring $3 to me any time. If you want a Camelbak bottle, bring $7 while supplies last. $10 will get you a bottle plus water! What a deal! A. Click the picture of author John Green on the left (yes, he's the guy who wrote The Fault In Our Stars, among many other excellent books) and watch his video about "How and Why We Read." WARNING: it's very fast-paced, so remember to pause & replay sections when you need to. In a composition book (or any separate notebook which you can use for regular journal/brainstorm writing), jot down brief notes about the points that he makes. When you are finished, write a paragraph explaining which 2-4 points you think are most important to you as a reader. It's up to you to choose whichever ones you like, but you need to explain clearly and convincingly why you think they are important. Be ready to discuss this with others when you come to class on Tuesday! B. Please click the link to sign up for Remind, a website I will use occasionally to send important text messages. 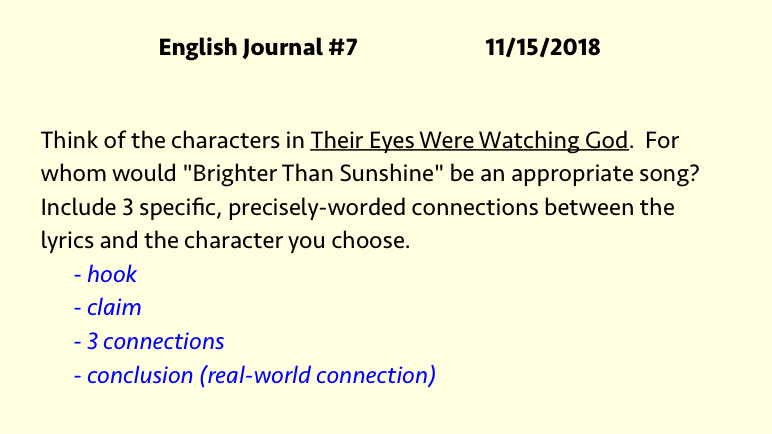 C. For those who saw me after class, here is the link to the ​9/10 Honors English summer assignment. D. The link to my class' syllabus is below.